The Regional Manager, Africa for ImmigrationEnforcement, British High Commission, Abuja, Mr. Bing Crosby, has visited the Lagos Zonal Office of the Independent Corrupt Practices and Other Related Offences Commission (ICPC), to have a first-hand assessment of the on-going renovation work at the office being sponsored by the British Government. Following the successful arrest and prosecution of visa fraudsters, ICPC over the years has enjoyed some assistance from the British High Commission which includes the renovation of Lagos Zonal Office; training of its officers; and the donation of an operational vehicle as well as ICT equipment. Officials of the British High Commission in Nigeria and the British government have at various times commended ICPC for the successful strides it has recorded in curtailing the scourge of visa racketeering at their High Commission in Nigeria. They have pointed at the fact that since thebeginning of their collaboration in 2013, very few visa-related fraud cases have been recorded unlike what obtainedin the past. During the inspection, the British Envoy assured ICPC of his government’s continued support in fighting corruption in Nigeria. 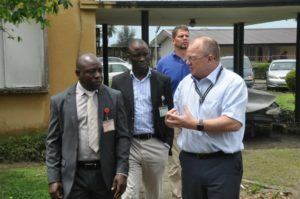 Mr. Crosby was in the company of the Director of Immigration Intelligence, United Kingdom, Mr. David Pennant; Regional Capacity Building Manager for East and West Africa, Mr. Liam Harrison and Mr. Neilnoughton, the Site Consultant for the inspection. In his remark during the visit, ICPC Zonal Commissioner, Mr. Shintema Binga, expressed his appreciation for the gesture saying that it would enhance the performance of operatives.